On Wednesday, March 13th, 2019 Portland City Council voted with an emergency clause to rewrite portions of city code 30.01.085, Portland Renter additional protections to better align its language with the recent passage of SB 608 from the 2019 Oregon Legislature. 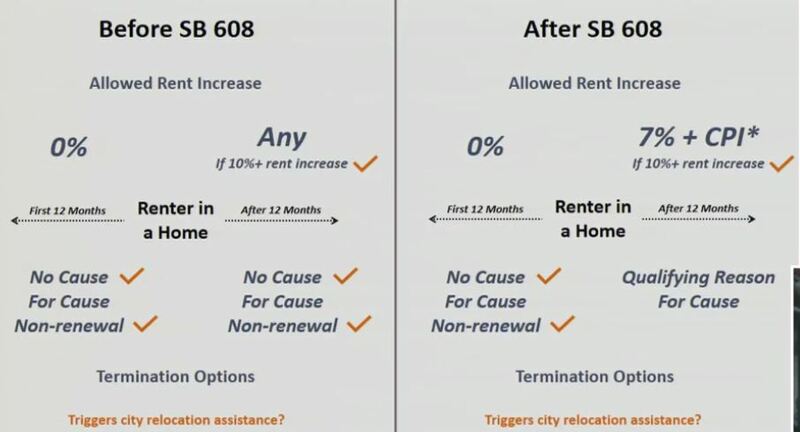 These fixes adopted on 3/13/19 included reiterating SB 608's Qualifying Landlord Reason for issuing an End of Tenancy Notice after the 1st year of occupancy, removing a shortened 60-day termination timeline regarding federal mortgage financing for the sale of a property (SB 608 did not make that accommodation), clarified several statements on how certain affordable housing may be exempted, and limited the total amount of Relocation Payment required if both the State payment AND City of Portland is owed. In order to benefit from a reduced Relocation Payment, the housing provider must pay the total Relocation Payments in full at the time the 90-day End of Tenancy Notice is served. 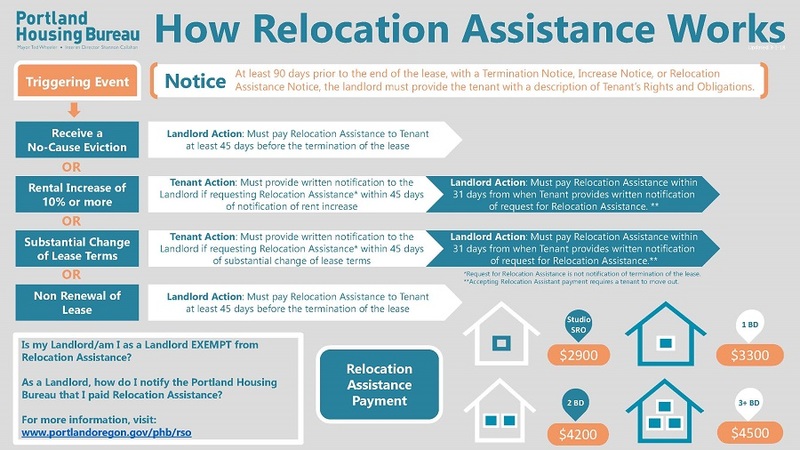 The city’s new language allows a housing provider to deduct the amount of the State Relocation from the amount owed by the city of Portland. Example: Say that the monthly rent was $1,500 for a 3-bedroom unit. The state requirement would then be $1,500 and the city requirement would be $4,500. The housing provider would reduce the $4,500 city payment by the $1,500 state payment, lowering the city payment to $3,000 and the state payment stays the same at $1,500. The total payment to the tenant would be $4,500. Previously on March 7th, 2018 Portland City Council again changed the relocation ordinance language, making the rule permanent and removing the 1-unit exemption. Several additional narrow-circumstance exemptions were added. The changes were passed with an Emergency Clause, taking effect immediately. The ordinance mandates payments from the landlord to the tenant when either an End of Tenancy notice is served, or an increase notice of 10% or higher is served, and the tenant then elects to move. If the landlord serves the tenant a 90-day Rent or Associated Housing Costs Increase notice, and the amount of the increase is 10% or higher within the last 12 months, and the tenant then requests the Relocation Assistance within the first 45 days of the increase notice period. If Relocation is triggered by serving an End of Tenancy notice, the Relocation Assistance is due to the tenant no less than 45 days prior to the termination date. If Relocation is triggered by serving a rent increase of at least 10%, the tenant may submit their "request for relocation assistance" within the first 45 days of the rent increase notice period. The landlord is then obligated to pay the relocation assistance within 31 calendar days of receiving the tenant's request. A landlord that tries to enforce the end date of a fixed-term lease or non-renewal of a tenancy is subject to pay the Relocation Assistance. A landlord that conditions a lease renewal on a rent increase of 10% or more in a 12-month period is subject to pay the Relocation Assistance. A landlord that temporarily rents their principal residence for an absence of not more than three years. A rental regulated or certified as affordable housing by federal, state or local government is exempt from paying Relocation Assistance for a Rent increase of 10 percent or more within a rolling 12-month period so long as the lease does not increase a Tenant's portion of the Rent payment by 10 percent or more within a rolling 12-month period or when Rent or eligibility is periodically calculated based on Tenant's income or program requirements. The affordable housing exemption does not apply to private market-rate dwelling units with a Tenant holding federal, state or local government voucher. In order to claim an exemption to Portland's Relocation Ordinance, the landlord must submit an application to the Portland Housing Bureau. Once approved the landlord may then serve the appropriate termination notice along with a copy of the PHB's approval of relocation exemption and a copy of the Notice of City of Portland Rental Additional Protections. Remember, if the relocation is triggered by a rent increase notice of at least 10%, the payment is due 31 days after tenant’s request for payment has been made. Alternatively, when the relocation is triggered by an End of Tenancy notice the payment is due 45 days after the termination notice has been served (halfway thought the 90-day notice period). Once a Relocation Payment has been made the landlord is required complete a record of that payment to the PHB. Multifamily NW has a Relocation Payment Receipt to use for your proof of payment. A Landlord that fails to comply with any of the Relocation Ordinance requirements are liable to pay to the tenant up to 3 times the monthly Rent as well as actual damages, the Relocation Assistance, reasonable attorney fees and damages.